The Idaho Transportation Department (ITD) commissioned a geophysical study to aid in the design of a replacement for an existing concrete span bridge. Because the river current was too swift to place geophones in the river, the solution was to shoot p-wave profiles in a reciprocal geometry (phones on land, shots in the river). In addition to the refraction work, a down-hole seismic profile was acquired to calibrate the surface data. Geotechnical boreholes drilled on the north and south river banks detected a laterally varying soil profile. The south-bank hole encountered 9.1 m of granular overburden, followed by 8.5 m of silt with bands of siltstone and arkosic sandstone. The north-bank hole encountered 13.5 m of granular overburden, followed by 4.5 m of arkosic sandstone. The seismic down-hole survey (south bank) determined that the compacted silt was 2.5 times stiffer than the granular overburden. The damping value of the silt was 80% of the granular soil’s damping. The author interprets subsurface and geophysical data as a granular overburden resting on an angular unconformity. The unconformity truncates layers of silt, siltstone, and arkosic sandstone dipping 19 to 25 degrees down to the north. Hard layers subcropped by the interpreted unconformity have produced two topographic highs on the refractor. Engineers should expect less granular overburden and more resistance to driving H-piles at these locations. This is an author-produced, peer-reviewed version of this article. 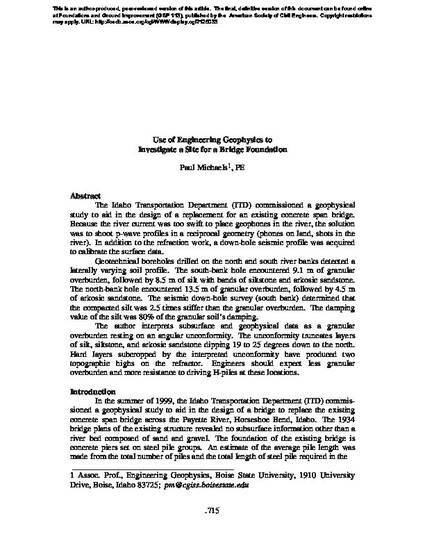 The final, definitive version of this document can be found online at Foundations and Ground Improvement (GSP 113), published by the American Society of Civil Engineers. Copyright restrictions may apply.